In 1823, Stephen F. Austin gathered a colony of about 300 to populate land along the Brazos river. They were called the Old Three Hundred, and James Orrick was one of them. 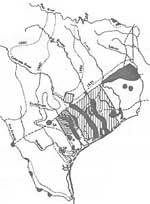 James received title to his labor of land (177 acres) in Austin county on Aug 10, 1824. He was listed as a mail carrier in 1835, and died around 1837. Many Orricks trace back to the Maryland Orrick families, but I have not been able to do that with James, or trace his decendants, if any. If you have information about this, please email me. Since I'm the author of this web page, I get to put a plug in for my 2ggrandfather John Orrick of Warren Tennessee. While not famous to others, he is to me and my family. John was born around 1826 in Warren County TN to Allen and Martha Orrick. He married Margaret around 1848 and had several children: Sarah Elizabeth (Bettie), James C., Elizabeth Violet, William, John Riley, Fannie. The children went by the name Arrick, Arick, or Ark. 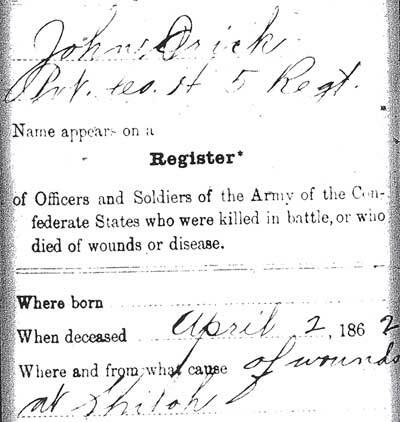 John fought at the Battle of Shiloh with the 5th TN Infantry under Captian E. J. Wood, and eventually died of his wounds on April 24, 1862 at a camp in Corinth MS. His burial location is unknown (Help!). In an interesting twist, his widow Margaret married a Union man - William B. Nunley in 1867. When he died in 1889, she applied for his pension. The pension application documents describe the shooting of John Orrick, the pronunciation of his name, and other details. Very few people have this type of record of their ancestors. John Cromwell Orrick Jr was born on December 23, 1844 in Alabama to John and Mariah Arrington Orrick. He was a private in Alabama's 5th regiment at the age of 17 and fought at Manassas, Seven Days, and Gettysburg, among others. After the war, John killed a man for calling him a liar and fled to Central America. He changed his name to George Washington and took his mother's maiden name - Arrington. Later G.W. returned to TX and eventually became a Texas Ranger where he brought many outlaws to justice. In 1879 he created camp Roberts in the Texas Panhandle, fought Comanche and Apache Indians, and opened the way for farming in the area. In 1883, G.W. married Miss Sarah C. Burnette and begain to raise a large family in Canadian, Texas. In later years, he suffered from arthritis and frequently visited the baths of Mineral Wells Texas for relief. 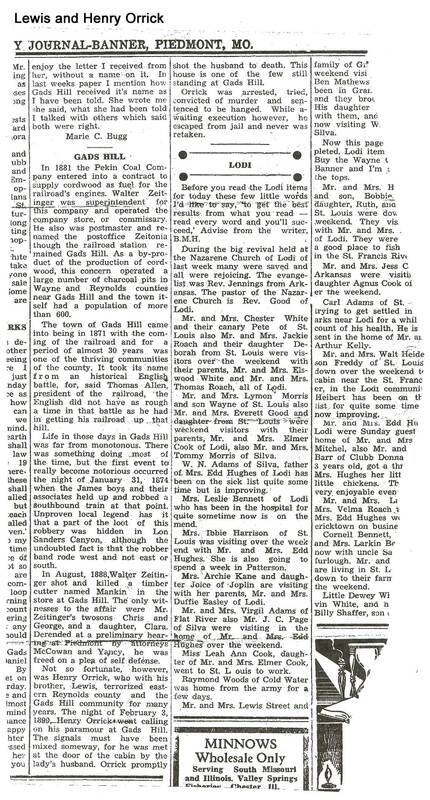 He experienced a heart attack on one of these trips and returned to home where he died on March 31, 1923. The Arrington Ranch is now a lodge open for visit. John's middle name, Cromwell, almost certainly indicates he was descended from the core Maryland Orrick family. Hannah Cromwell was wife of Nicholas Orrick (1725-1785) in Anne Arundel Co, MD. The Cromwells trace back to England. Exactly which John Cromwell Orrick Sr is Arrington's dad remains a bit of a mystery. Nicholas and Hannah had a son named John Orrick (1753-1810) who married Sarah Merryman. They had a son named James Orrick (1789-1821) who married Ann Bosley. They had a son named John Cromwell (1813-?) who could be Arrington's Dad. He's not the only John Cromwell Orrick but he fits the timeline, and he is unaccounted for as far as I can tell. William Horsley Orrick, born 1889, was son of Oliver Summerfield Orrick who moved from Maryland to northern California around 1870 were he owned a paint manufacturing business. William was one of the founding members of the powerful Orrick, Herrington & Sutcliffe law firm in San Francisco, and father to Federal Judge William H. Orrick, Jr.
William Horsley Orrick Jr was born in San Francisco in 1915 - son of the founder of the Orrick law firm. He was assistant attorney general in the Kennedy administration and was later appointed by Richard Nixon as a Federal Judge in US District Court. Orrick spent almost 30 years as a Judge and presided over many high profile cases including the sentencing of Patty Hearst (later released by Jimmy Carter and pardoned by Bill Clinton :), San Francisco school desegregation, and the Oakland Fire Department discrimination lawsuit. Orrick passed in 2003 in San Francisco at the age of 88. There are several Lewis Orricks and several Henry Orricks. Keep that in mind when reading this story because most were fine, upstanding folks. From 1885 through 1899, brothers Lewis and Henry C. Orrick terrorized the communities near Gads Hill in Wayne, Iron, and Reynolds counties of Missouri. 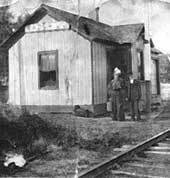 Gads Hill is famous for being the location of the first train robbery west of the Mississippi, at the hands of the Jesse James gang. Eventually, Lewis Orrick was hunted down and shot by a posse while hiding in a pile of hay. 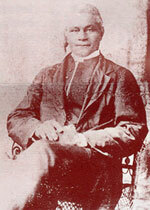 On Feb. 3, 1899, Henry Orrick went to visit a woman friend and was suprised when her husband answered the door. Henry shot him dead on the spot. He was captured, prosecuted, and sentenced to death by hanging. Before the sentence could be carried out, a laxity in jail management occured. 10 notorious convicts acquired keys somehow and let themselves out - Henry included. To this day he rides his horse around Gads Hill shooting surprised husbands. Ok, I made that last part up, but it sounded so good I couldn't resist. Henry was never seen again after his escape. Article 1, Article 2, Article 3. Surveyors for the North Missouri Railroad traveling from Moberly to Kansas City found that a straight line between these two points was one mile south of Albany. In an effort to make loading and unloading goods more efficient, the company chose a location near a village on the line and bought some land. They hired civil engineer Willoughby W. Orrick of St. Charles to draw up a plat for the property, and he was allowed to give his name to the new town. 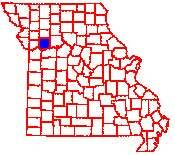 Orrick, Missouri was incorporated in 1873. Orrick (1887-1947) was the great-grandson of John Orrick and Urilla Stonebreaker through their daughter Lucy Ann. John Orrick descended from the Maryland Orrick family and was wealthy and had politcal influence. Orrick Johns was a poet and playwright, and part of a literary group that included T.S. Eliot, F. Scott Fitzgerald and Ernest Hemingway. He was born in St. Louis MO to journalist George Sibley Johns and wife Minnehaha McDearmon. As a young boy he lost his leg in a street car accident. Orrick wrote an autobiography Time of Our Lives: The Story of My Father and Myself. He was an active member of the Communist Party and ultimately died by suicide. During the civil war, troups dismantled several buildings in Stephens City, VA to get materials to build shelters. This included the African American Methodist Church. Preacher, successful business owner, and former slave Robert Orrick (1827-1902) provided financial assistance to rebuild it. The chapel was named in his honor and still stands today. Nearby in Winchester is the Orrick Cemetery also named for Robert who donated the land. Burials date back to 1794. Robert was born a slave and began his business of hauling freight in 1859 by paying his master for his time at the rate of $65/year. As a slave, he could not carry out business transactions, but his freeborn wife could, and she did so on his behalf. Ultimately, he owned the largest livery business and feed stable in the city of Winchester VA and at his death in 1902, his wealth stood at $25,000. I have not seen the details of Robert's ancestory or history. If you know, please send me an email. David Oreck, founder of the famous Oreck vacuum cleaner company, is from a family in Duluth MN, and his ancestors are from the Ukraine. This Oreck family is not connected to any North American Orrick that I'm aware of.